Perched high on the hills overlooking Marlborough's Awatere Valley, our Loveblock is far removed from the agricultural bustle in the valley below. From here you can almost see the end of the planet; the peace lifts you above your troubles. At Loveblock, we are charged with creating the best wine we can to express this extraordinary place and its unique aspect. We follow our deeply held belief in low intervention farming which enables the wine to show its true and naked terroir. 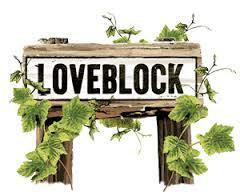 Loveblock is our heart and soul. Wine Enthusiast 90"This wine offers a heady mélange of lychee, peach, pineapple and rose water, with just a touch of tomato leaf. Tangy fruit follows onto the palate, which has a lovely, viscous texture and tingly acidity. It’s a highly likable, mouthwatering drop." Water white with a hint of green and gold. Lifted aromatics with white peach, passionfruit and citrus notes. White peach and tropical fruits abound. The lingering finish is underscored with mineral acidity. New Zealand's signature varietal tends to be bold and big. This wine focuses on texture rather than enhanced aromatics. In order to take some of the sharp edge off the palate, a small portion of the wine goes through natural and malolactic fermentation.
" The new project of Erica and Kim Crawford (yes, THE Kim Crawford), Loveblock is situated on a spectacular windswept promontory overlooking the sea. Passion fruit, vibrant and pure, marks the nose, while the plump palate reveals hints of gooseberry that linger through the extended finish." ~J.C. Wine Spectator 90 Smart Buy" Supple and smooth, with a nice punch of acidity to the orange zest, lemon, green apple and fresh thyme notes. Intense and delicious, offering a very long, juicy finish. Drink now. 7,000 cases imported. "